After a 2 and a half year wait, Jung Yonghwa has finally made his solo comeback with That Girl. The main vocalist of CN BLUE previously made his solo debut in January 2015 with One Fine Day. That Girl is a track from the mini-album, Do Disturb, and the track itself features Loco, a well-known rapper and hip hop artist. That Girl attracts similar comments to his solo debut tracks, Mileage and One Fine Day. While it doesn’t appeal to my personal tastes, what I did like about the song was the confidence that Yonghwa exerted via his lyrics and the vocalist’s vocals. The brighter sound compliments the catchy sound of the chorus and the melodies are pretty good. But besides all of that, the track just doesn’t seem to hook you in for long. Instead, the verses, which should have continued the momentum from the chorus ended up lacking that energy. Loco’s raps were a big no-no to my ears. It felt foreign and unexpected, which didn’t work with the rest of the track. Actually, his parts felt like a completely different song entirely. Although I only just listened to the track a few times (which means there is room to grow), I can’t stand his final remarks at the end of the song. It was 100% cringy and awkward to listen to. Overall, I guess you can categorise the song as ‘okay’ based on my comments. The music video wasn’t too bad. I liked the colour and I thought the colour suited the atmosphere that the song had. The confidence, which I mentioned previously in the song part of this review, was portrayed nicely by Yonghwa throughout the video. It was totally evident once he entered the bar at the start of the video. But the side of Yonghwa that needed a little more confidence was Yonghwa in the choreography segments. Though I am not writing a section for the choreography, I can say that it looks pretty good. I know Yonghwa isn’t a dance idol but you could see it was very awkward for him to dance in the video and it made it awkward for us to watch. He starts off good, but that confidence or energy just disappears, which is disappointing. But overall, it was a good video to watch. 7°CN is CNBLUE’s latest release and their 7th mini album since debut. So many releases over the years and I only just remember getting hooked onto their debut single. I wasn’t going to do an album review for this mini album, but I thought, ‘why not?‘. It is also a sign of thanks for your endless retweets, likes on Twitter and the huge amount of views for my review of CNBLUE’s latest track. To date, you guys made the 24th of March the most viewed day in the history of my blog and made the review the highest review of the year so far (865 views in just one day). The force of the Boices! CNBLUE has returned with their 7th mini album, 7°CN. This is their first comeback to the Korean stage since You’re So Fine, back in April of last year. Since then, the group had another (5th to date) concert tour and released more songs in Japan. This song is amazing. Am I too straightforward? At first, it sounded a little awkward to me. CNBLUE is a band and for the longest time focused on more traditional instrumentals when it comes to bands (such as guitars, drums, keyboards, pianos and vocals). But the chorus this time is dominated by synths and electronic sounds. This isn’t the first time the band has gone for this style, but it is done wonderfully in this song. 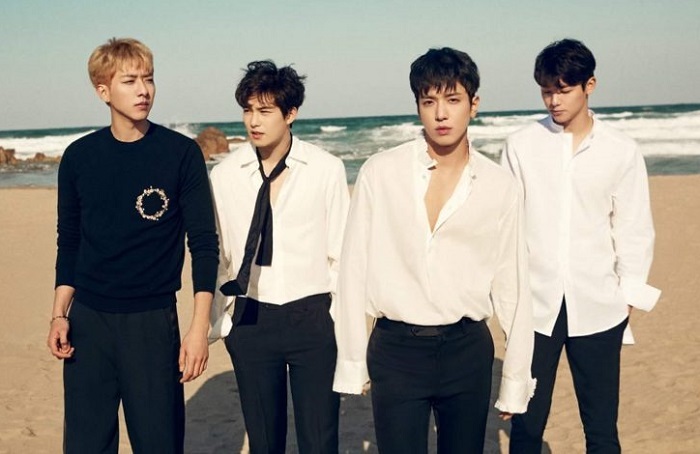 It keeps true to the band’s roots and the rock sound that I yearn to hear from CN Blue each time they come back, something that was missing from their last comeback. The chorus is made to headbang along with, something that I have been doing when the song pops up on my playlists or as the next automatically played video on YouTube. Per usual, the song is dominated by Yonghwa’s vocals, with a small distribution going to Jonghyun. I am a little disappointed because it has been a while since we have heard Minhyuk or Jungshin in their title tracks. But this song suits Yonghwa and Jonghyun’s vocals very much. There is a big difference between their singing abilities, but in this song, both voices worked well with each other. Everything was really catchy and addictive. And I mean everything (vocals, beat, instrumental). It’s a really good track and is a track that I would be willing to recommend to new listeners of KPOP. The music video was interestingly shot. I personally thought it was a cool video to watch. There isn’t much to it. For the most part, especially, the chorus focused on the band. The camera circled the band, who were playing the instruments. It complimented the more upbeat and faster tempo of the song at that point. The verses slowed down a bit and showed more of the individual members. They spoke on the phone to their lovers. They used a flip phone and a brick (for those who do not get the term ‘brick’, it refers to the old mobile phones that resembled the shape and weight of a brick) for those scenes and Jonghyun was featured in a phone booth. Next, you would tell me this video was shot 10 years ago. There was a lack of colour, but that didn’t ruin the video. Instead, it had other effects on the video. Either the scenes were presented using a black and white filter; or while filming, they directed quite a bit of light to focus only on one area. It looked stylish and focused the attention of the viewer at one spot, where the member(s) were in the scene. I just was not into the overlaps of scenes and images (see feature image above). It made it look too messy. The idea behind them was nice, but it just looked messy. Overall, the video fits the song perfectly and vice versa. So much work to do and yet here I am procrastinating. It is funny. When I don’t have anything to do but write reviews, I procrastinate then and find work that I have put off for weeks and months. Wasn’t actually planning on writing a review until tomorrow since today was extremely busy, but hey, CN Blue cannot wait. Yep, the band is back with a brand new mini album. That being said and all this talk about being busy, the boys are extremely busy with promotions and also solo work. It is officially Spring and you can tell by listening to this song. 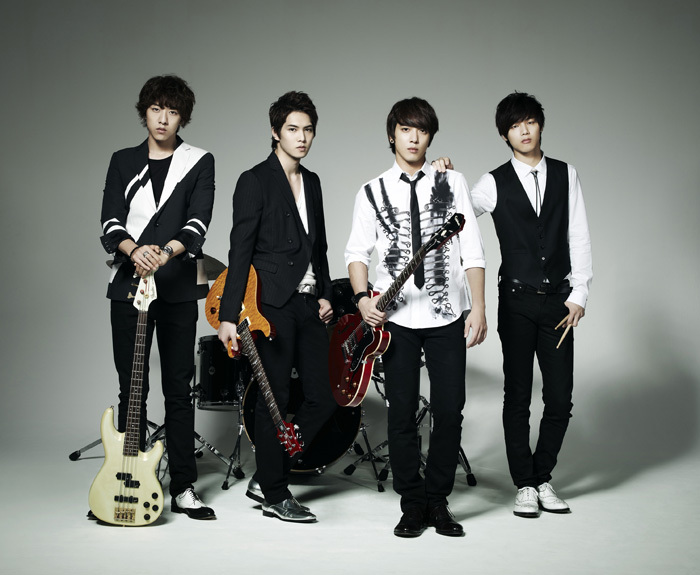 CN Blue usually goes for a powerful rock / pop track. Something with a little more energy and bass is a sound that I would associate with CN Blue. However, this time around, they went with a song that has a mellow feel to it (but in a cheerful sense). This is the song that you would sit outside on a grassy field, with blue skies all over and there is just a nice breeze. That or cheery blossoms. Oh wait the song. I really do like the song. I was kind of shocked when I first heard it, but I grew to like this song. I don’t love and I don’t think it is their best song ever, but it is still a good song. The vocals were great, though the small sections of rap or the short instrumental we got for the bridge were kind of awkward. It has that “throw your hand in the air” kind of feel, but they are just hanging down near my hips. Though, I do love the instrumental. Combining that band feel with the saxophone did wonders to my ears. It isn’t overpowering and the volume of the vocals and the instrumental is just right. The music video was boring. The guys are in this lobby hotel. Minhyuk is getting his hair cut. Jonghyun is getting this poor kid to polish his shoes. Jungshin accidentally gets locked in the elevator. Yonghwa is the singer by the bar. Okay. A girl walks in and each guy is suddenly drawn to her presence. She some hows manages to interact with all of them indirectly (by giving people around them flowers). Then she goes and gets changed, and each of the guys decide to sit there and wait for her to come down and blind them with her beauty. Might have added that last part. But there wasn’t anything in the video to make me go wow. The video just had me thinking “So what?” throughout the video. It wasn’t climatic and it just didn’t do much to portray that spring feeling. I did like the set, very colourful. And there is what I liked the best regarding the video. Their clothing isn’t that great as well, but very retro. CN Blue is back with a brand new album. This year, the members have focused mainly on solo work up until now. They have returned to acting and also launched solo careers in Yonghwa’s case. He made his overdue debut with One Fine Day at the start of the year. The band itself has been busy in Japan, releasing singles after singles that topped charts. They also have had many concerts in the few months in between Yonghwa’s debut and their second album release. This song is a great song. Their last few songs have been quite mellow and more ballad like. This song picks it up quite well and adds that Summer feel that I don’t see much in CN Blue’s songs. This song is catchy and addictive to listen to. We don’t really see much bands in KPOP, so everytime we get something from CN Blue, I get excited. This song gets me really excited. It kind of reminds me of the tune of their debut songs and the few songs they promoted afterwards. I love the “ooo~”s that we get throughout the song. Jonghyun’s and Yonghwa’s voice compliment each other a lot in this song. In the past, Jonghyun was given a small part of the song, but in this song, he has parts that are spaced out more. Jungshin’s part, which was the “Somebody help me” was great as well. I am disappointed that Minhyuk did not get much of the song beside the drums and the “ooo~” that we aren’t really sure if it is his. They also nailed the English this time around. 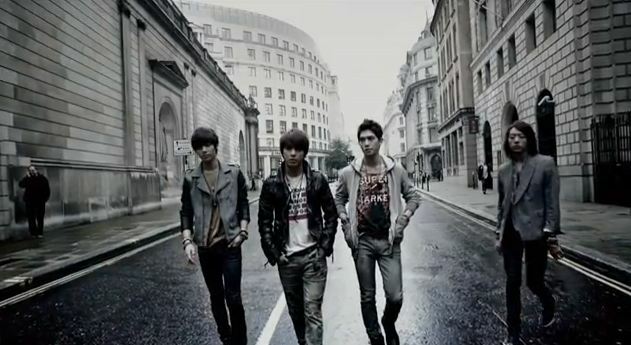 It was a great song and a nice throw back to the era of CN Blue which I liked. As for the music video, Minhyuk’s arms. Damn, someone has been to the gym. Hahahaha… It is weird that the girl was there one minute and all of a sudden she disappeared, with a glass slipper to replace her. Like I get it for Minhyuk’s part where he looks away and then when he looks back to see that she is gone, but honestly Yonghwa’s part where she was halfway through shaving his non existing beard and then all of a sudden he leans forward and she is gone. What a teaser. And where on earth is that small laundromat? I have never seen a place look so small. Essentially, two washing machine are found in that small room and it looks so tight that they barely have any room to stand, yet somehow they made some room to sit down on the floor and chill for a while. Jonghyun’s part was also weird. He leans to the girl for the kiss, but she just vanishes and leaves a slipper behind. Jungshin probably got the short end of the stick and the only form of skin-ship with the girl, was a simple bump. But I love how dark the rest of the music video was. Does it match the song? Probably not. But I thought the test looks quite nice and reflected the mysterious nature of the girl that disappears and randomly leaves glass slippers. And how many pairs of those shoes does she have? Like why are there so many glass slippers at her disposal? Jung Yong Hwa is back. For those who don’t remember, Jung Yong Hwa, the leader of CN Blue, promised a solo album. He pre-released his first song, Mileage, a few weeks before, and has officially released the whole album, with One Fine Day being the title track. I need to address something however. Companies really need to get some word out regarding the status of some singles. One song is released first, and then they turn around and say it was a pre-release. This really ticks me off. (Yes, I know I haven’t reviewed Jonghyun’s other title track and I don’t plan to, because I did not read anywhere that there was dual title track thing going on). End of rant. Proceeding with review. Once again, it was an okay song. I am still hoping for a rock themed song as I have said in my Mileage review. But oh well. This song lacked appeal to me. I can’t really say it had no colour since the song and the music video was built up with that idea of having no colour. It is a very slow ballad. I like ballads, but when they seem to be dragged out most of the time (like this song), it feels boring and bland. The chorus is quite nice, instead of building up the song, it kind of plateaued off. Though if you want me to say a good word about the song, I liked the piano instrumental in the background. The start really does not show off Yonghwa’s vocals, but at the end does. Overall, I like the ending of the song more than the start. That is a first for me, I guess. The music video, as I said before, was built around the lack of colour. During scenes when Yonghwa is with the girl, there was a range of colours. But when he was alone, such as his close ups, there is definitely a lack of colour. Overall, I feel that the lack of colour contributed to the overall feel of the song and it made the music video more symbolic. In the video we see Yonghwa meet with a girl and start dating. However, the couples drift a part which leads to a sad video. In the end, they meet up again, but with another person they love. Just both can’t seem to forget each other. Yonghwa’s club scenes were a little creepy at the start. He looked like some creepy person smiling across the dance floor that would make you uncomfortable. After like a whole year of re-scheduling and a lot of articles about the new solo “coming soon”, Jung Yong Hwa has yet to make his official solo debut on the stage. However, CN Blue’s leader has teased us with a new song. This is just a pre-release, with the actual solo debut set to occur at a later date (later this month). Hopefully, they don’t push this around anymore and let him make his debut. And then make a CN Blue comeback!!! Asking too much? Getting too personal? This song is okay. I always hoping for something along the lines of a rock themed song as that is what I grew up to know Yonghwa and CN Blue. Thankfully, this is just a pre-release, so I can still hope for the full album right? Anyway, this song also compliments his soft voice. I understand many people love him for his dreamy love songs and dreamy voice. Just this is a change that I really saw unexpected. The song is quite sweet but at the same time is also quite funny. The rapper was a little too passionate for this song. While Yonghwa was being dreamy via his voice, the rapper’s voice sounded hard and harsh to this song. This song isn’t catchy and that appealing on a whole. It as, to me, a one listen song, where I basically listen to it once and forget about it. The music video was pretty cool. Some parts annoyed me. I know that for creative purposes they cutted out shapes and stuck them onto objects such as a soju cup or a vacuum cleaner. Yet why couldn’t they just used the vacuum cleaner or soju cup instead of “faking” everything. To you, it may not be a big deal and that I could be really picky. But hey, that thought stayed in my mind the whole time I watched the music video. Beside that, I thought the bed scenes were hilarious. It was really creative. It is the first time I ever saw a bed stuck to the wall and the dudes were playing around, but really they were walking around. That is pretty cool. Blew my mind for a wild (mainly because it took me forever to get). CN Blue has finally returned with a more softer image. Move over rock side of the band, welcome to the world ballad side. It has been a year since we last saw the band as a whole promoting a new song on the stage. Their previous song, I’m Sorry, was a major hit and did pretty well on charts. After countless number of individual activities through solo song promotions and dramas, we finally get to see them in flesh. Almost every song they have released has always been a hit and this song proves it. Despite the competition they have at the moment, the band managed to capture their first win this Wednesday. Congratulations! The song is more of a ballad rather than that really addictive rock song that we tend to here. It has been toned down from their last song, which to me is really disappointing. But needlessly to say, this song is pretty good itself as well. I am just not used to this softer side of the band. However, this song I think is equally as good as their previous songs. The instrumental is really subtle and for some reason, i am not troubled by it. I don’t know why but a few songs (most of which I have not reviewed) sound kind of weird, but this song is pretty good. The piano at the start really suited the song. And I liked how the other instruments were slowly added to the song. The chorus was really cool and catchy. Not as addictive as other songs, but still pretty good. The vocals are kind of weak in my point of view. The voices are a little whiny in my opinion. Jonghyun sounds really awkward and I think he suits more of a fast paced song than any other. But still pretty good! The music video was pretty boring in my point of view. Though the song was great, the music video dragged out for a very long time. Not sure about CN Blue’s obsession with foreign girls though. They look awkward together. I find it really weird that they chose the most popular member to be the lead actor, but I have to say he is pretty good. Looks like Yonghwa is a professional (I don’t watch K Dramas, well beside Melody of Love at the moment). He portrays the role pretty well. I like the whole idea of the mirror acting as a passage way into both worlds. There are two things I just find that does not work at all. Yonghwa makes a sound that is loud enough for her to hear. She looks towards Yonghwa, but then turns her head in the opposite direction. Like, I think a mirror making the sound would capture your attention straight away… I don’t believe it. Also, it really ticked me off how the smashed glass pieces became coloured balls. You know, how that just ruined the pleasant feel of the video. I expected literally smashed glass, not some randomly 2 year old play pen balls. But beside those two complaints, the music video was pretty cool. 8/10. Not bad, just some mild things that did not sit right with me. Go CN BLUE!!! I’m Sorry is a really good song. As soon as I heard the song, lets just say I was rocking it hard. The start where the girl is like “It’s Over” over the phone is pretty unique. The guitar, drums and vocals in this song is superb, but what else are you meant to expect from one of the most popular KPOP groups yet To me, there was some kind of influence, that I felt in this song from American bands like Train etc. Really, this actually adds more competition to the game. If this song does not win, I will be disappointed. If you have not listened or watched the music video for this song, where have you been? This is one of the best songs of the month. The chorus is exceptionally catchy, especially those moments after each chorus. Pretty cool. The music video was quite cool, but quite confusing. I guess if this music video became a drama version music video, like what T-Ara and Speed has, I guess added dialogue would’ve helped cleared up some confusion I have. Jungshin was the easiest to understand, as this is on the line of a love song, where the guy is sorry for breaking up. He takes a rose, which probably signifies his loneliness, and smashes it on a pole, scaring the living daylights out of his really, really annoying girl. Let me tell you one thing, buses and trains where I live, don’t have talking people on it. It is basically “Shut up or get off” kind of policy. That girl is quite… Minhyuk in this video is sorry, for smashing a chair and cutting his hands with broken glass shards, however, is it something that he said or heard from the people around him or a girl that angers him? Then, it gets worse. Jonghyun is sorry because he cannot busk for his girlfriend in a subway tunnel. I am sorry? I don’t quite understand. Yonghwa on the other hand is angry because he broke up with his girlfriend on the phone. I don’t see any logic in the anger there. They all join up, and end up throwing something that means a lot to them, like their relationship, for example Yonghwa: his phone, which was the last piece of contact for him with his girlfriend; Minhyuk and his bloody bandages; Jungshin and his lonely rose; and Jonghyun with his guitar pick. Yeah confusing as it is, the only thing I want to see live is the Engrish used by Jonghyun when he talked to those security guards. Classic. He live is pretty good. First band, in probably a long time, to play live with their instruments as well. Jonghyun was pretty hyperactive in the performances as well. CN Blue made a comeback in Japan in December with the song, Robot. Despite it being an anticipated comeback from fans, I view this as a failure. After it came out, nothing happened. I did not see people hyperventilating over this song as they did with Hey You or I’m Sorry. To me, I don’t like this song, but I don’t hate it. It is not just for me. To me, it was a weak song for them to sing. despite it showing their ability to change their sound and ability to sing, I was quite disappointed. I like most of CN Blue’s songs but this is just not for me, It is a J-POP song but can I just say that it is more like 80% English, 15% Japanese and 5% Onomatopoeia . I found the beat and instrumental okay, just it was not as great compared to I’m Sorry (which the review should be coming out at the end of February or early March). Yonghwa dominates this song once again, leaving Jonghyun the other vocalist of the group to sing such a small part of the song. But beside that, nothing much else to say about the song. Well, beside their English. “I’m a robot” sounds like gibberish to me, but it is okay. The music video was quite simple. Them playing instrumentals, with a whole heap of electrical cords around them. And then the cords fall. It is okay, but something a little more epic would’ve been better to suit the song. Slo-motion scenes of the cords breaking is not what I would say is epic, but quite lazy. But hey, it still looked good. 5/10. It was okay, but could’ve been better. I really like CN Blue. They are a South Korean Band not a dance group. While all the viewers are amazed by the choreography or a song, it is great to know that there some groups/bands dropping choreography. An exmaple is CN Blue. They are just rocking on the stage doing their thing. This song, I believe revisits their “I’m A Loner” days (I think I have I’m A Loner review somewhere here, but for some reason it won’t upload). What I love in this song is the catchy-ness of all of their songs, without doubt this one. There is one flaw which so far I have picked out, the completly legit Engrish in the song. Now I know, CN BLUE is not known for having foreigners in the their band but seriously, “Once again, back again. Beautiful, beautiful, beautiful one day.” Why can’t they just leave out the part in English and just have Korean in their song? I am sorry if I angered any BOICEs out there. It just me sincere thoughts about the song. Beside the English, the song was really good. Like who is he? Where did he come from? Well, there is something we all know, the PD or director went a bit over the top while looking for people to dance around like a dork. Also, Jonghyun took this guy’s red stick away. What does the guy do? Dance. Like A Man. LOL. Just a live band playing their own song. 9/10. The music video was funny and the song lyrics were confusing. Besdie those things, everything was good.